WeChat is a communication service in voice and text messages to mobile phones made ​​in china country in Tencent. WeChat is an application that can be used in multiple Operating Systems ( OS ) is Android, iPhone , Windows Phone , Symbian , iPhone and BlackBerry . Currently WeChat already has approximately 300 million users worldwide . WeChat application is very easy to come by , simply by downloading it, then this application is you can use on the phone. If Facebook is famous for Status Update feature , it is also famous for its WeChat Moment . moment in WeChat virtually identical to other social networks . But at this moment in WeChat gives a different feel that with the addition of image appearance . The addition of an Image preoccupation moment that makes the display more interesting , if you do not want to display the pictures, you can also display the moment the writing alone . The feature I really like , because we are easy to make friends with people around the feature . WeChat makes it easy for users to track the location of the local people with a distance of up to 5-10 KM , so with these features will make it easy for us to add friends or find people who might be familiar . Features WeChat shake is a feature that is very interesting , because just by shaking your Mobile , then you will find the same person the Mobile wiggle . people who you find very varied without distance limitations , could malaysia , australia , china and others. Drift bottle is featured with 3 types in it , you can throw a bottle of yours that you have given both text and voice message , you can search for the message bottle from someone else and you can also special message from your personal bottle message . How exciting is not it! ! . 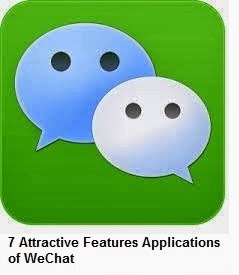 Excess WeChat other features are shared and Group . You can automatically connect and share moments or your posts to facebook , Google+ and twitter . To be able to automatically share , you have to enable the feature first. In addition , the latest version is 5.0 WeChat provide additional group with a capacity of 100 persons / group , this will allow us to deliver important news to our friends at once . In version 4.0 it WeChat not added this feature . but in version 5.0 or 5.1 there is already served a variety of interesting games . These games not only challenging , but some time there will be a quiz or games with prizes hosted by Tim WeChat .